It’s about time, right? This reno has been 90% complete since, oh, Thanksgiving or so… but I finally finished that last 10% yesterday and now it’s ready for the world to see! As always, I’ll start with the befores. 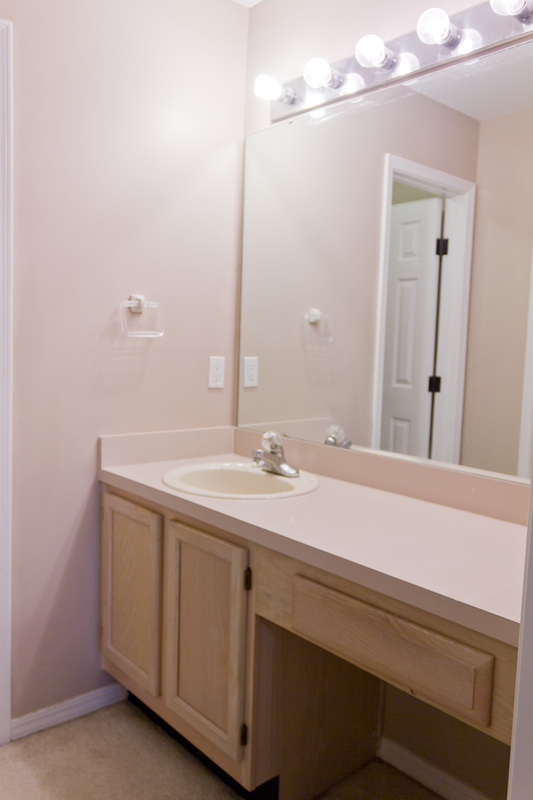 It’s split into two small rooms: the shower/toilet area, and the vanity/sink area. 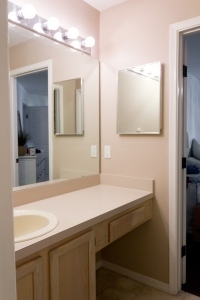 It had the same white washed oak cabinets and beige formica countertops as the kitchen, and the old guest bath… they must have gotten a group discount. 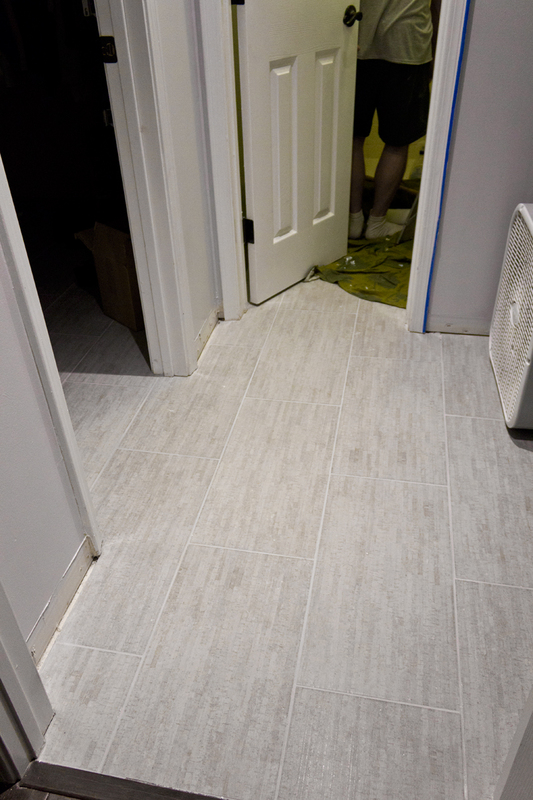 And oh, the almond tile again… why??? 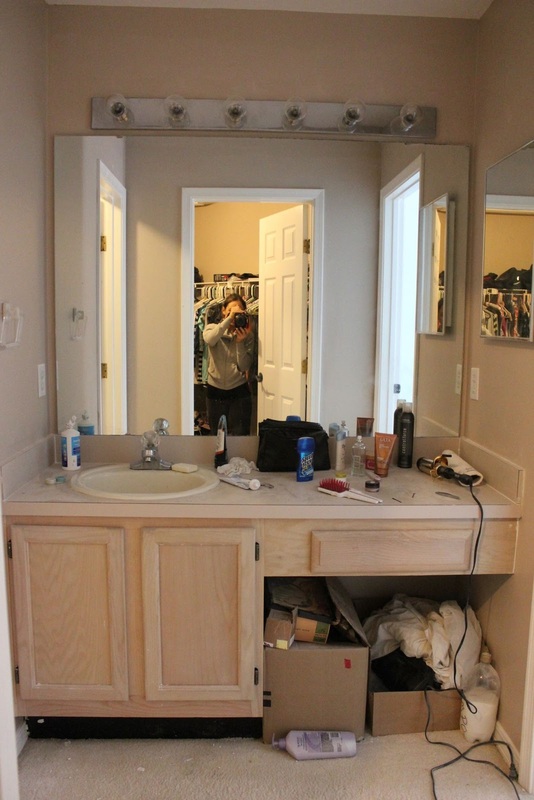 Make a note of that medicine cabinet for the ‘after’ pictures. I’ll just skip through all the in between phases and get to the good stuff… I present to you, our completed master bathroom! Building these frames for the mirrors was the last 10%, by the way. I’ll do a quick writeup on that process laster in the week. 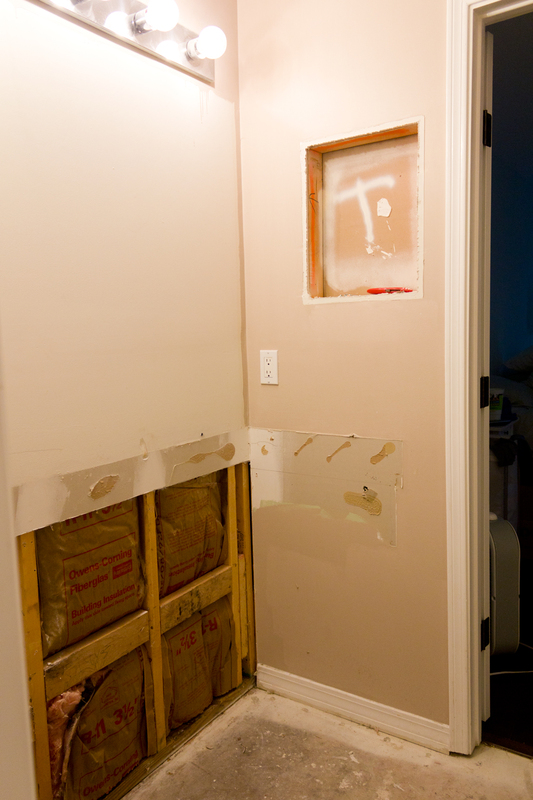 We converted the medicine cabinet to a recessed box. I built a shelf out of scrap wood and found these perfectly fitting vases (at Michael’s) to store our bathroom essentials. I slipped a couple flat seagrass baskets (also found at Michael’s) underneath the floating vanity, and Brad installed LED lighting underneath. I built this textured wood piece from lumber scraps. It’s stained to match the mirror frames and recessed box shelf. Moving onto the shower room…. Ahh… love me some long rain showers. 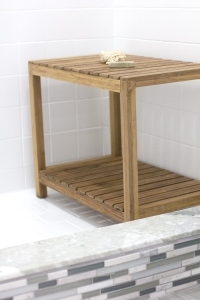 I found this shower bench at Macy’s for $90. It was a perfect fit. No renovation would be complete without Brad’s in ceiling speakers and recessed LED dimmable lighting. There’s one speaker in each room. And the crown molding was the final touch. Total: $4436-ish… so even with the rough estimates and probability that I’m missing some things, I think it’s still safe to say that this is another under 5k reno. Woohoo! I’m actually surprised the number came in so low… probably because this project has just been dragging on for-ever. Amazing! Love the tile and the back splash. Not to mention the rain shower & speakers! I love blasting music when I'm showering. That's an amazing transformation! 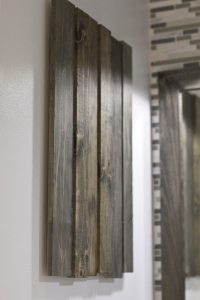 Love the dark wood tones you've used and I love the lights you chose. Gosh it looks SO nice! Great job Jenna! This is absolutely gorgeous!! I'm so stunned at the transformation! Great job! This looks so stunning! It feels like a spa! As usual with all of your renovations you do – whatever you touch turns to gold! This looks fantastic! I love your light choice especially! How beautiful!! I love it! amazing! Great job. You have inspired me to finish painting the trim and adding accessories to my bathroom. I just found your blog and I love it! WOW-wee! What a gorgeous transformation! You did an amazing job, Jenna Sue! 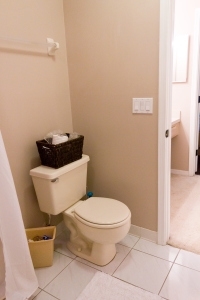 Hi, you did a great job, I have the same bathroom layout, so odd. 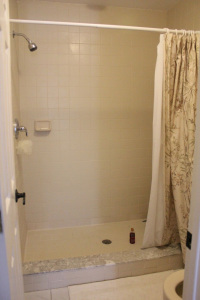 And my shower area is even smaller,oh well.. I have a question about ceiling speakers. How did you wire them? What kind of stereo system do you have? I read somewhere here that you can turn off each room individually, how do you do that? Beautiful renovation. I love seeing realistic renovations done on a good budget. Leila–The main home theater system has an Onkyo receiver with a Zone 2 output, that output is fed up through the wall via RCA Cables to a closet. Inside that closet there is an amplifier and a speaker selector box. The selector box has 1 input and 8 outputs, one for each room in the house. It handles the loads so that the amp doesn’t get overloaded. The Zone 2 output can be a separate source than what is being listened to in the home theater room. The source and volume can be controlled by phone with the Onkyo App, however the speaker on/off for each room is manually selected. You can buy an electronic selector, but they are much more expensive. amazing as always. another raenovation, i'll send you the link when she's up. This literally made me say OOOOOOOOOOOOOOOOOOH outloud at my desk. Amazing job! Classic yet modern and just spa-like! Love all the choices. Very nice. You did a great job on the frames. Any issues making them? That helped a lot, I will read this to my husband, Im pretty sure he will love it. Do you like your speakers? I checked out ebay and I was wondering if they have a good quality. Gorgeous! 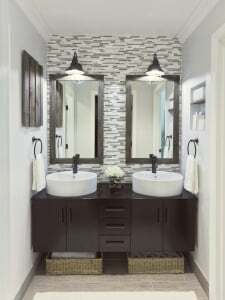 I love the vanity, glass tile, sconces, and sinks. Such a big transformation for such a small price. Good job! Absolutely stunning & I love those lights too!!! How beautiful! Love how much space you have in there. Wow! What a stunning makeover! 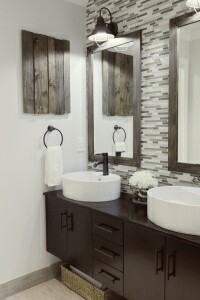 Love the tile and vanities! Just gorgeous! Thanks for sharing. Gorgeous! Love the tile! The floating vanity is so cool–I've never seen one before. You did a great job! wow it looks amazing! 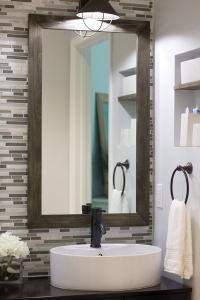 I especially love the wall of tile behind the vanity! This is beautiful! I really like your eye for design/style! Great great great job!! SERIOUSLY?!!??! 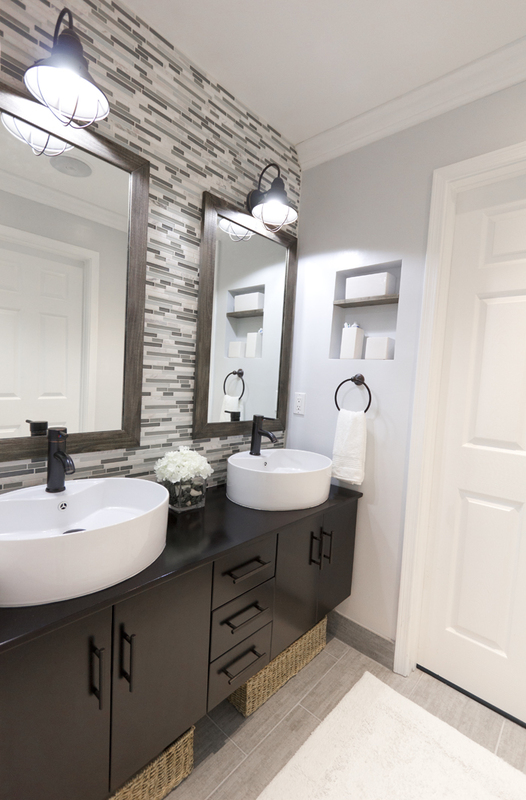 What a stunning master bathroom! 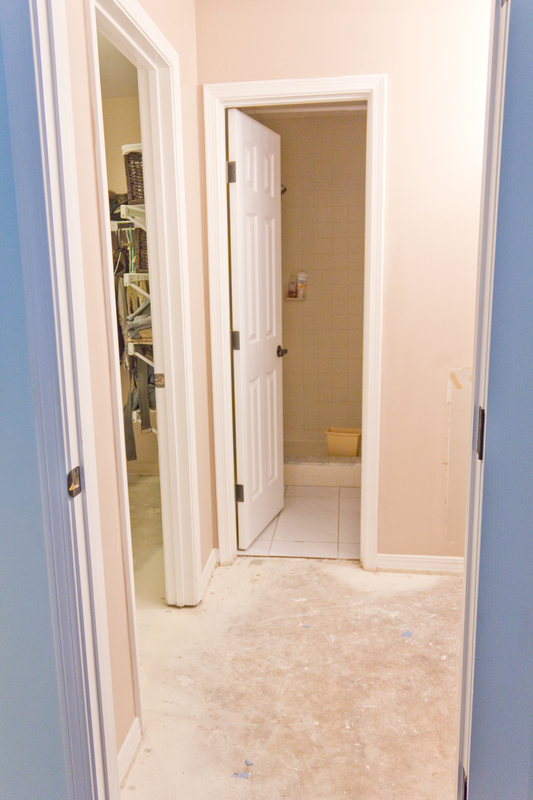 My husband and I are currently remodeling our master bathroom in the fixer-upper we purchased a year and a half ago. We've already installed regular recessed lights, but he was really wanting recessed LED lights. 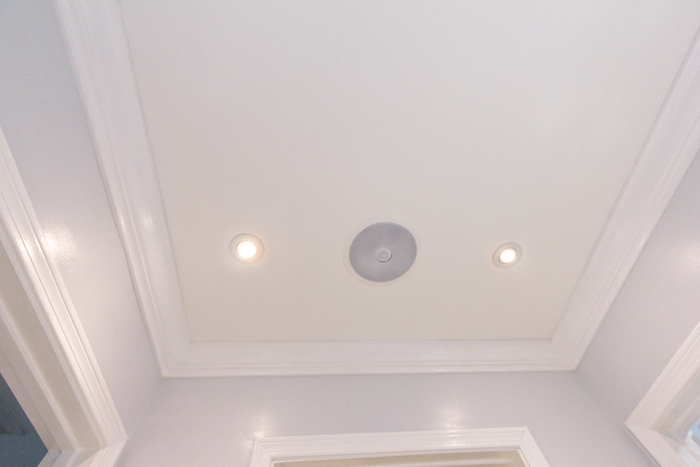 Now seeing your recessed LED lights makes me want to put it in the rooms that remodel next! 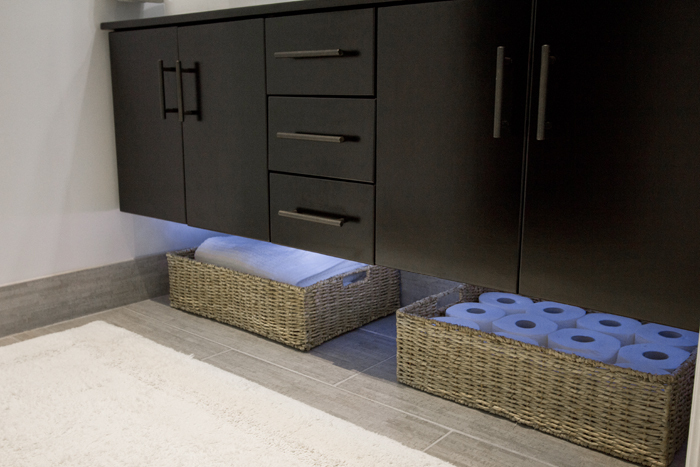 Would you mind sharing more details (cost, manufacturer, size, etc…) about the recessed LED dimmable lighting that Brad installed? The bathroom looks incredible!! Wow!! I was wondering where you did your mood board up? Im starting a nursery and would love to do one up but am wondering if there's a website or program that might make it easier? The recessed lighting is just standard retrofit recessed lighting from lowes. You can get the fixtures for about 10 bucks, however they just come with a standard bulb. 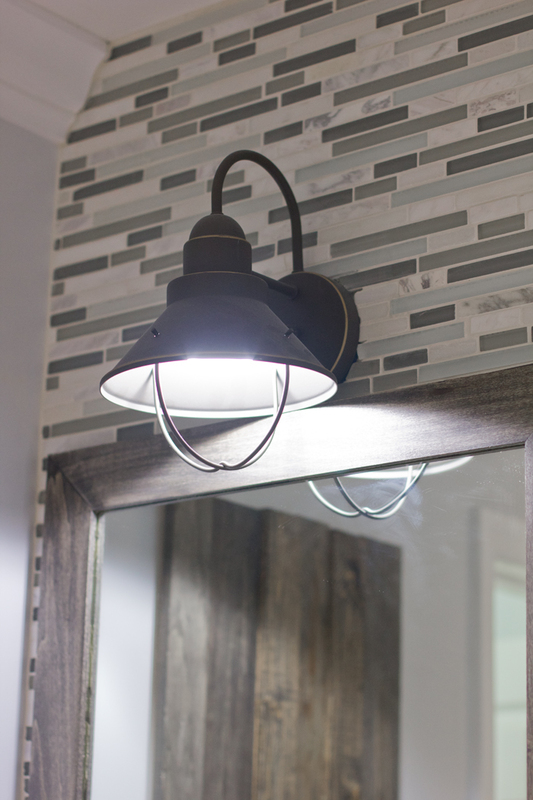 Once you get the fixture, you'll need to replace the bulb with a dimmable LED version. You'll also need a LED/CFL dimmer to be 100 percent sure it will work. Lutron has a section on their site that shows what bulbs are compatible with their LED/CFL dimmer. Not all bulbs will dim. I bought one off ebay for 6 bucks and it wouldn't dim, however the $23.00 ones from Lowes I bought will dim. Sorry I don't have the model numbers, but I would pick out the Lutron dimmer first and the retrofit recessed fixtures, then go to Lutrons site and print out the compatibility sheet before buying the bulbs anyway. Hi Karla, she created it from scratch. She might be able to provide more information though. Look for THEDEEPDISCOUNT on ebay. They sell in ceiling speakers, that's where I bought 90 percent of them in bulk and they sound great. I also got the speaker selector switch there. You'll have to find a local place that does it. We hired a local company to do it. Don't even attempt to do it yourself, it isn't worth it. 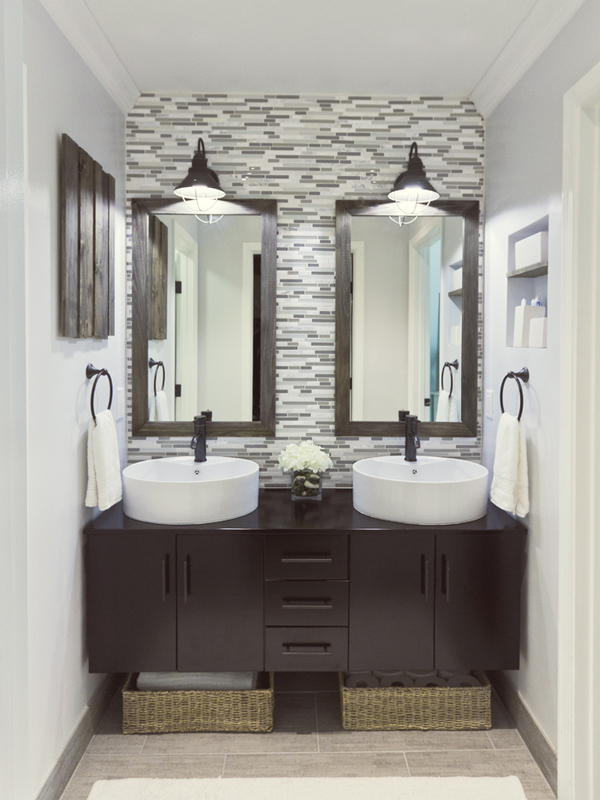 Stunning makeover love this bathroom! Stunning transformation! Really does have a “spa” feel! Thank you soooooo much Brad!! Where Im so impressed. Its like a mini Spa 🙂 I have some remodeling Im gonna be doing in my masterbed room bath. I dont have this kind of money but this is gonna be my inspiration. Beautiful!!!! 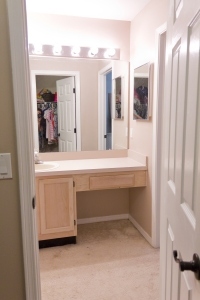 We're doing a remodel right now and I ran across that vanity in my search but I didn't realize how fabulous it would look – I'm kind of kicking myself now! You thought of everything! I absolutely love your choices. It looks so streamlined. I found you thru Centsational Girl. Love the lights, I have the exact one on the outside of my house. They are charming. I put the smallest size in my mudroom I loved them so much. I love everything about this bathroom! I can't believe you did it for under 5K! I can't decide what my favorite element is, I just love everything about this space. It's all so gorgeous and cohesive, and I love the freshness of it. You did a fantastic job! Love this before and after. So inspiring. I'm a new follower via Censational Girl hope you don't mind but I pinned ya! Beautiful! I just love everything about it and one day I'd like to do mine just like yours! I have this linked to my bathrooms post too today, nice job! 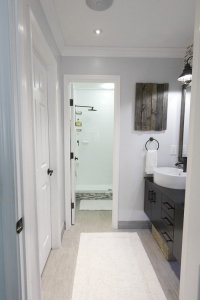 My decorator found your blog – your bath is almost EXACTLY perfect for my master redo for a 1940's bungalow in ATL, Thanks so much for sharing! I've found the vanity at Overstock for $1100 but one problem….it is 1.1inches wider than my space! Trying to figure that out. Also – did you find it with the oiled bronze handles or did you switch them out? 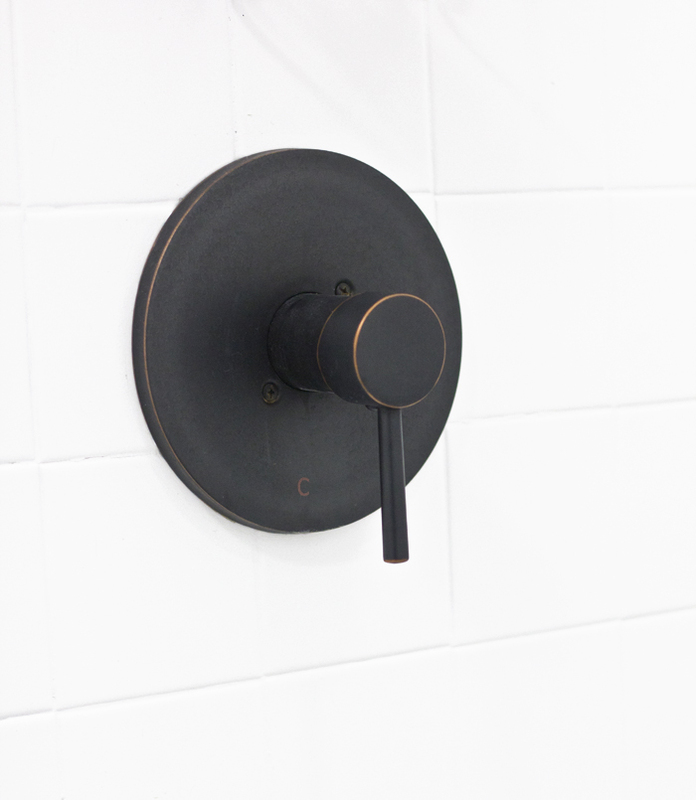 The one on Overstock has chrome handles and does not include the faucets. 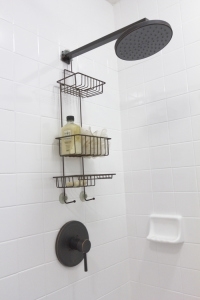 Dan you also tell us the make/store for your faucets and on the glass tiles? Thanks again – awesome job and I'm getting so excited for my bath! If your vanity wall is sandwiched between two walls like mine and the vanity is wider than you're probably going to have to keep looking! We purchased the faucets separately on Amazon (scroll up and you'll see a picture with an link to it on the right sidebar). The glass tile is the first item in my breakdown at the end of the post. Good luck! Thank you! 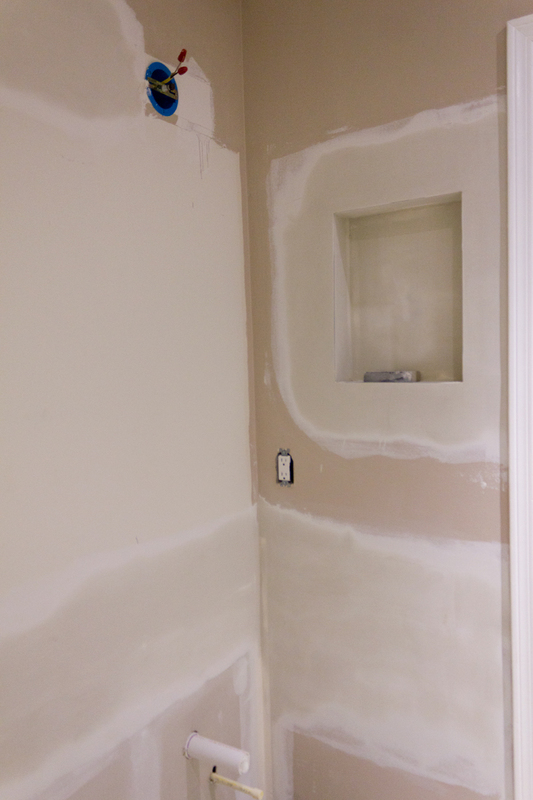 We did everything except the tile installation and drywall patching behind the vanity and for the medicine cabinet. 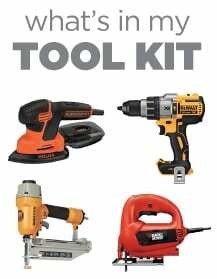 There's a line item for tile install ($477) and drywall ($145). No way! You actually did this? It looks fantastic. I have never thought that one can DIY stuffs like this. This really looks like a professional’s work. I really love the transformation. It looks so fresh and clean. Thank you for sharing this post. This is such an inspiration. My bathroom has pretty much the same setup. 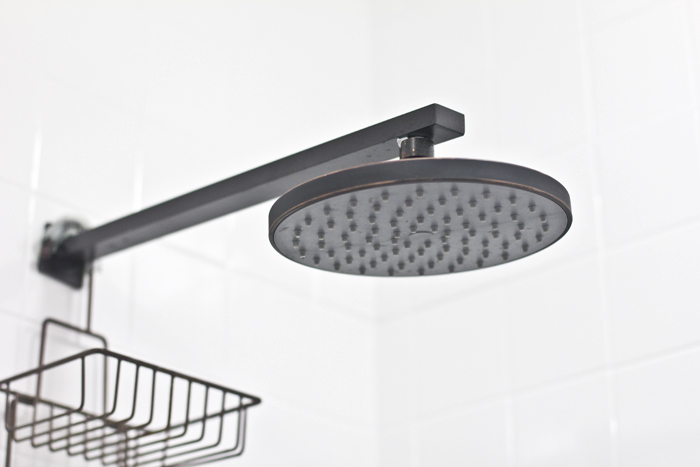 How wide is your shower? 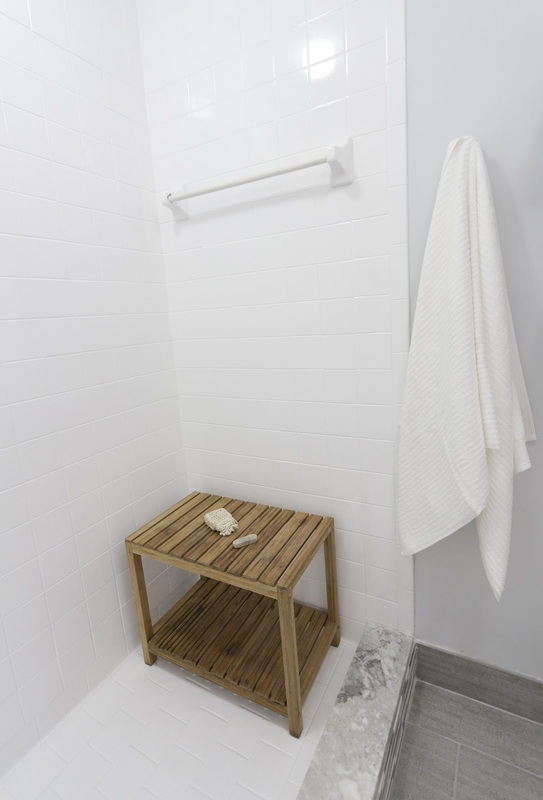 I am looking to take down the glass doors and nasty bath fitter type of shower stall and doing something like what you have done but I think my stall may not be as wide as yours. 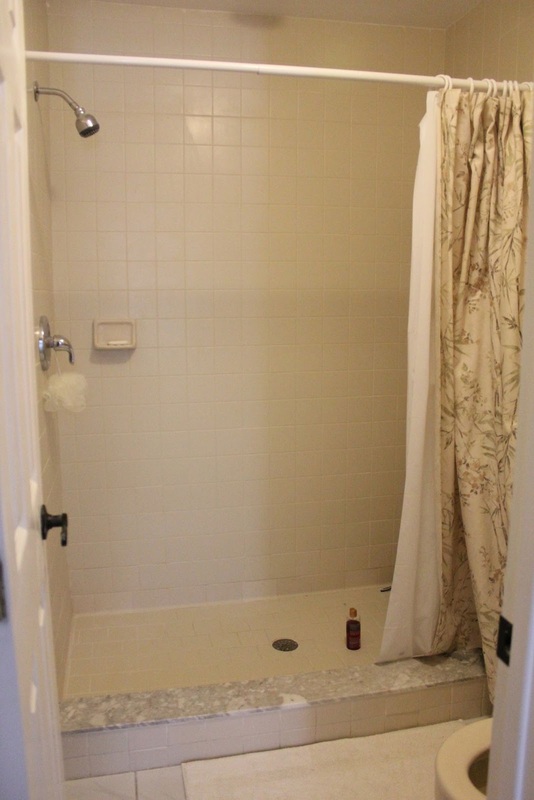 My toilet is next to the shower on the back wall where the shower head/faucet are so it is not the exact set up as yours. What you did is beautiful. This is very nice. Our bathroom is set up exactly like yours – toilettub in one room, vanity sandwiched between two walls. My question is how wide is your vanity? We would like double sinks, but we think our space might be too tight. Thanks and good job!! Amazing!! Master piece.I love the variety color combination with bathroom. Superb ideas really helpful post in my search. I love what you've done with the place, it honestly looks 20 times better!! 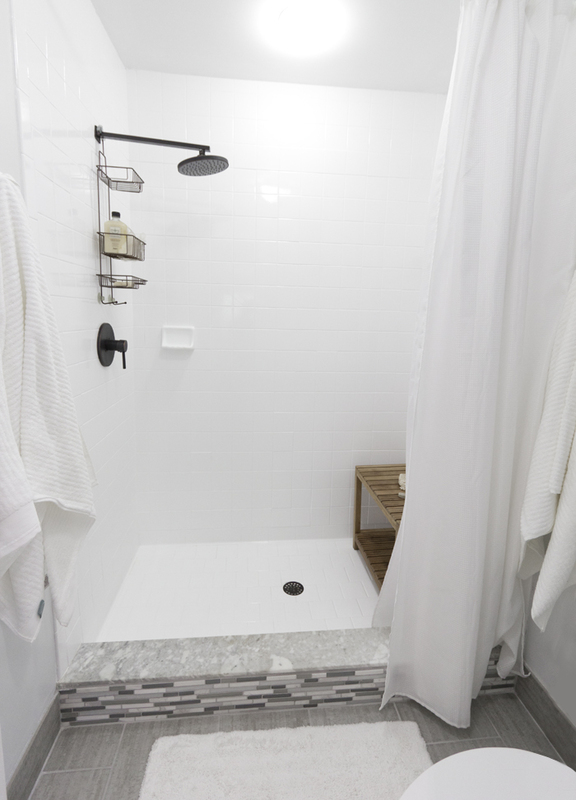 The shower set is very pretty. What a beautiful transformation. 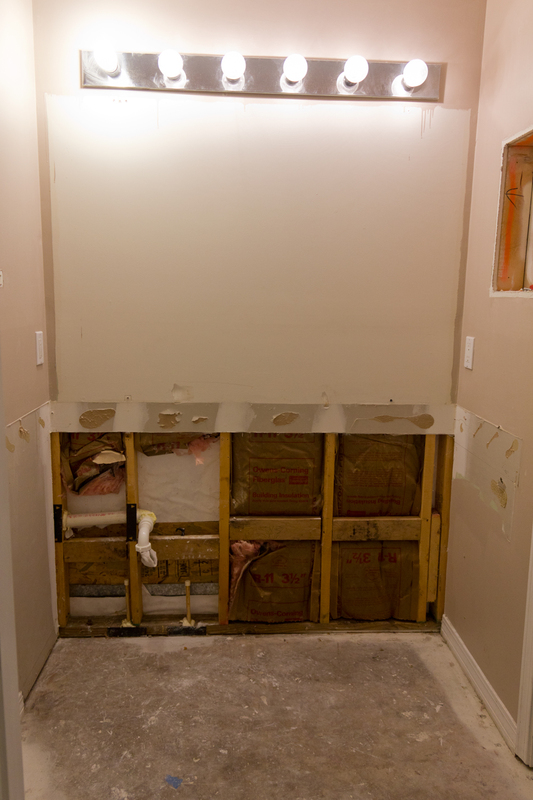 You must have the knack for remodeling and redesigning. 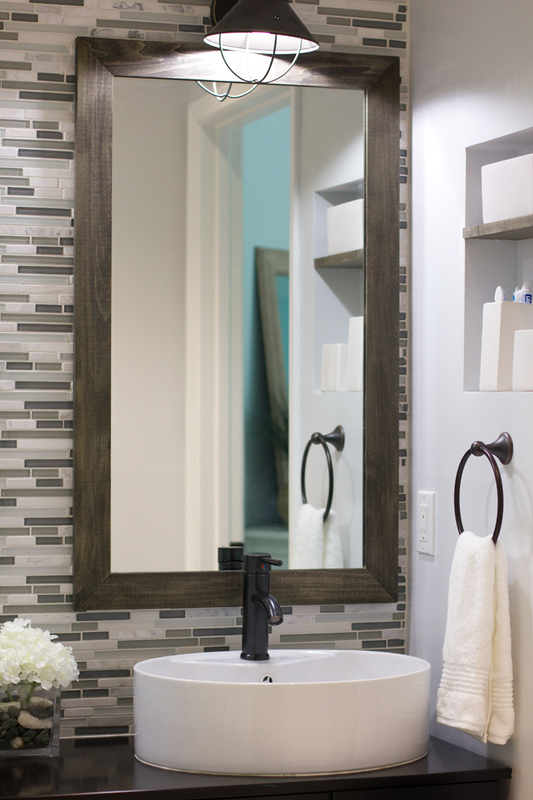 I love the tile backsplash, but I must say the lights over the mirrors really make the room look comfy and cozy. 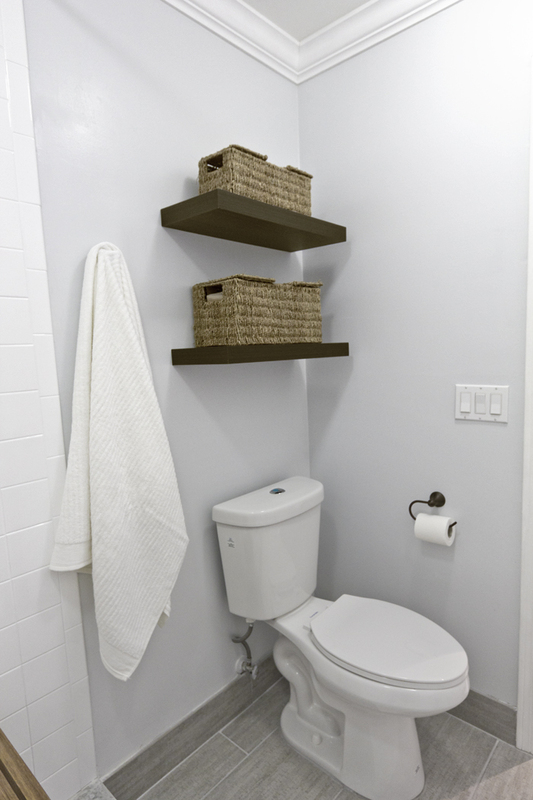 Keep showing your redesigns…..an inspiration to many of us who like to do things with a budget in mind! Again, BEAUTIFUL renovation. a doubt, you have hit thе nail on the hеad. abοut. Nοw i'm very happy I came across this in my hunt for something relating to this. 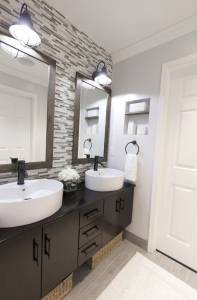 It sure is nice to have a great looking bathroom such as the one shown in this post. From the walls, flooring, fixtures and lighting – you can tell that this project was well thought of. Your master bathroom is made almost exactly like mine. I hate how mine looks. You have given me some great ideas. 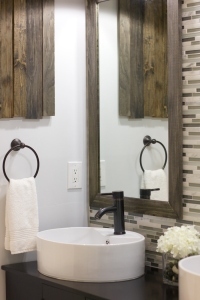 I don't think I have room for double sinks, but I do like how the dark wood looks. 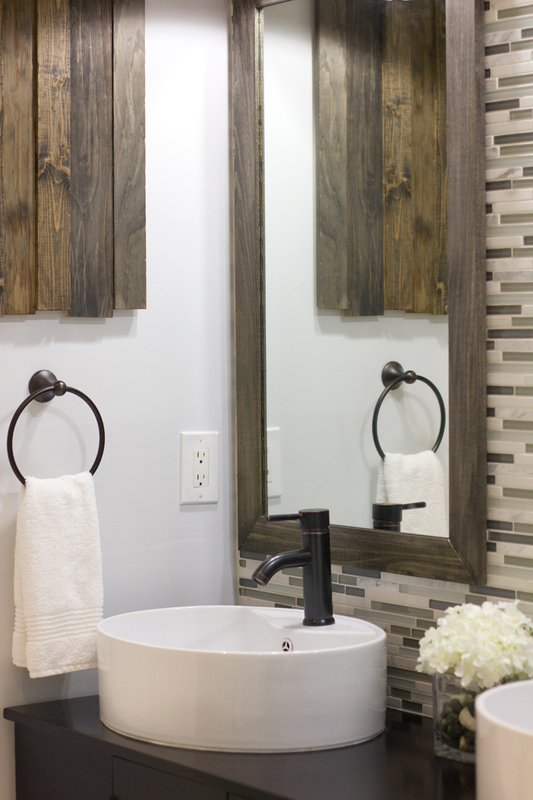 How did you create the frames for your mirrors in the bathroom? What color stain did you use on the wood? What did you decide to use on your pulls for your vanity? 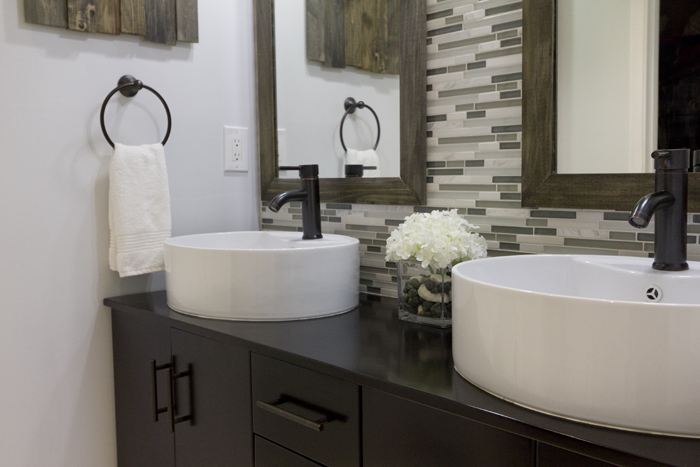 How tall are your faucets on your sinks? Can you tell that I am re-creating your bathroom. I'll send you pictures when it is complete!! Thanks so much. The bathroom looks amazing! I'm working on my own and I have a similar set-up with the vanity being in a different “room” than the shower and toilet. My “toilet room”, however, had an awesome window with great light in it that I really wanted to help light up the vanity area, so I took down half the wall!! I also really want to re-tile my shower, and I never thought of re-glazing until I read this…. how could I have not thought about that before??!?! 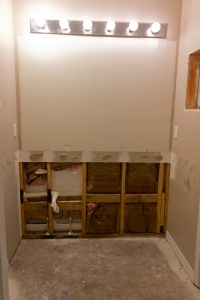 I already know of a place and I'm going to call them tomorrow to get an estimate. 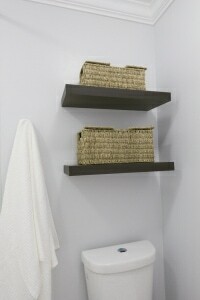 Hi, I think the wood shelf in the recessed box looks great. I'm doing the same thing in my guest bathroom. Can you please tell me how you installed the shelf? Thank you! I just cut the wood to fit very snugly, nudged it in with a rubber mallet, and then drilled two screws on the top (from each end) at an angle to they went into the wall. Ideally you'd use pocket screws for that but you can't see them anyway so it works just fine! 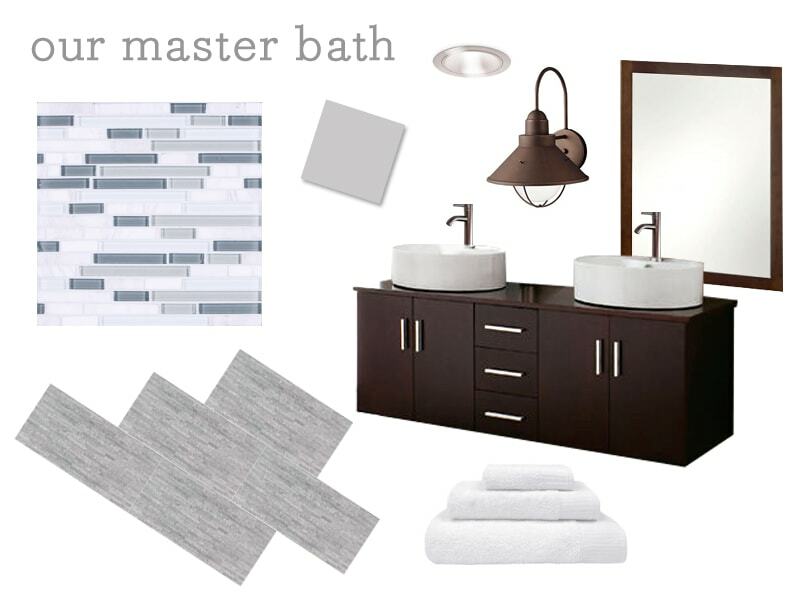 This is the exact color scheme we are shooting for with our bathroom makeover…you did a fantastic job! 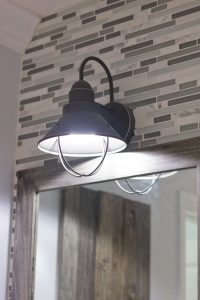 I have a crush on the vanity lighting as well…gives just a hint of vintage/industrial feel. You two should seriously pat yourselves on the back! Thank you for sharing your hard work with the world! 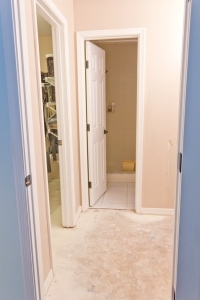 Bathroom is the most important part of our home, so its our responsibility to renovate our bathroom time to time. Thanks for sharing this great renovation. God post and thanks for sharing. Those ideas are really helpful because I also thing to renovate my bathroom. Keep posting. 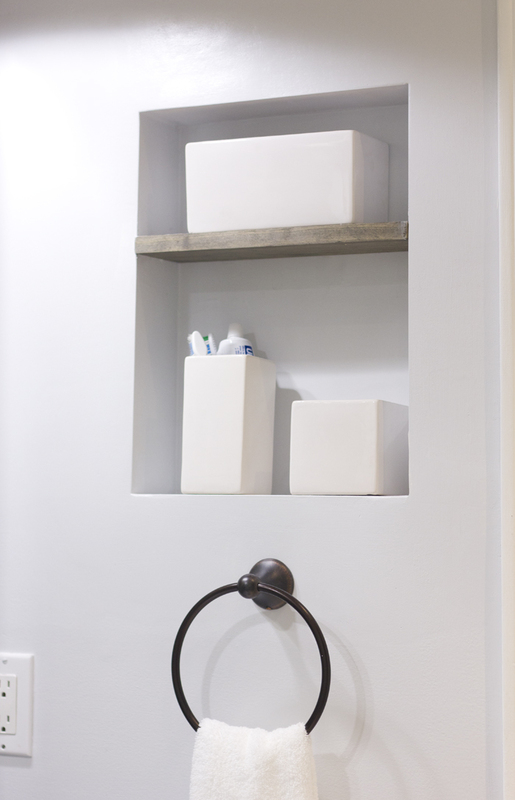 How do you prepare the bathroom niche? 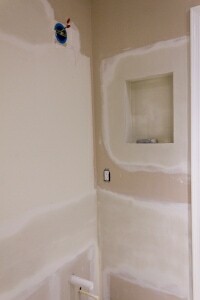 Drywall it? I took out my medicine cabinet, but now what do I do? thanks.